The TalkSwitch 240vs is the compact, all-in-one telephone system that puts the rich features of PBX systems into the reach of small offices. Its voicemail, multi-level auto attendants, innovative remote extensions and sophisticated call handling features help businesses look big, reduce communications costs, and stay connected everywhere. With standard connections for fast and easy installation and free PC configuration software, TalkSwitch 240vs system set-up and changes are a snap. TalkSwitch 240vs is the perfect phone system for new businesses, small offices and home-based businesses. TalkSwitch systems can transform your business with uncompromising phone features at unprecedented prices. Single and multi-location organizations come in all shapes and sizes and each one has its own unique telephone needs. So we designed TalkSwitch with a smooth evolutionary path that protects your investment. TalkSwitch is made to expand with you as your company grows and changes. Add lines, extensions, VoIP trunks or all three with TalkSwitch upgrades, or add other TalkSwitch units to your network for increased capacity. 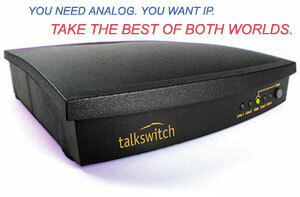 TalkSwitch systems can be expanded up to 16 traditional lines, 16 VoIP trunks and 64 local extensions. FREE SOFTWARE UPDATES. YES, FREE. Software: TalkSwitch comes with free user-friendly Windows-based configuration software. We continually add features and functionality to the configuration software, and we don’t charge for updates. Warranty: The TalkSwitch 240vs is covered by a limited one-year warranty. Extensions: 4 standard 2-pin RJ-11 ports — TalkSwitch 240vs supports up to 4 standard analog telephones and fax machines or 4 IP telephones. PA Output: 1/8" mono phono jack to connect TalkSwitch 240vs to a PA system to announce calls, or to a local speaker to monitor incoming calls and voicemail. Audio Input: 1/8" mono phono jack allows connection of standard audio devices (CD players, radio or PC soundcard) for music or messages on hold. TalkSwitch can also play .wav file stored on TalkSwitch. Incoming Lines: 2 standard 2-pin RJ-11 ports. Support for Caller ID and distinctive ringing. 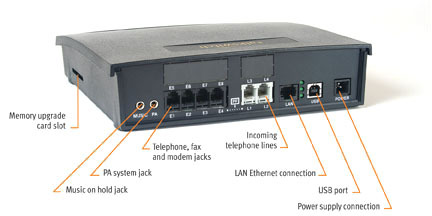 PC Connection Ports: Ethernet and USB ports connect the TalkSwitch 240vs to a PC for configuration. Ethernet cable and configuration software included. The system can function without connection to a PC after configuration. Power Source: 120 VAC, 60 Hz — In. 16 VAC, 1.5 A — Out. AC adapter included. Memory Card Slot: The TalkSwitch 240vs has 30 minutes of built-in voicemail and auto attendant memory, which can be upgraded by up to 9 hours. The memory can also be expanded by 1- and 2-hour license codes.